User experience is a term that is thrown around a lot in the world of design. The term can be used in product design, interior design, or industrial design, but I’ll focus on what it means in reference to web design. As websites and technology evolve to be more complex, there’s a push to keep websites user-friendly and ensure your users have a positive “user experience.” But what does this mean? I’ll walk you through what user experience really is, why you need it, and most importantly, how to get it. 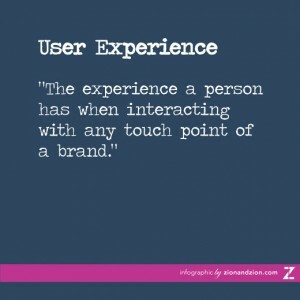 What is user experience? Just like any industry term, there are many differing definitions for user experience. If you’re new to user experience, it can be daunting! First let’s look at where the term came from, and then where the industry has taken it now. The term was brought to public knowledge by Don Norman, co-founder of the Nielsen Norman Group. Norman’s life work is centered on user-centered design, the idea of designing for the end user. While Normal coined the term in the mid 1990s, the industry has grown and changed so much since that time, that the definition itself has to adapt to where we, as an industry, are now. Nowadays, we are creating user experiences for an unlimited number of screen sizes to ensure our users have a great user experience, no matter what device they are on. Due to the growing number of devices, the way that we create user experiences has definitely changed since the 90s. Based on the research I have done, industry conferences I’ve attended, and my experience creating user experiences for the growing number of devices, I crafted my own definition of the term. So why this definition? It’s simple and it’s to the point. It’s also broad enough that it allows for future growth of the industry. In a few years when we are creating user experiences for the stove-top browser, or the sunglasses browser, the definition doesn’t have to change. It will always be focused on giving our users a great experience when they are interacting with your brand. 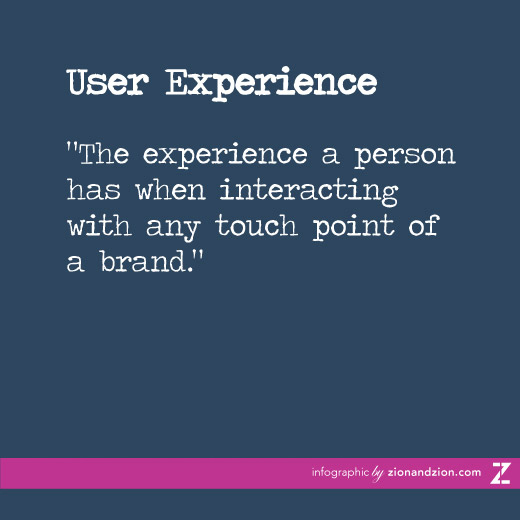 The other thing I like about this definition is that is does not limit user experience to websites, but any touch point that a user has with your brand. The bottom line? Whatever it is that we are creating; we want to give our end-users a great experience when they interact with it. What makes up user experience? There are many elements that make up a great user experience, but there are a few key fundamentals I think make up the basis of creating the best experience for your users. This is true for your messaging, content, user flows, design and UI elements. Ensure that everything you’re creating is concise and to the point. Eliminate the noise to create clarity for your users. Pushing all the information to your users at once is one of the worst things you can do. Prioritizing can be extremely difficult when you have multiple stakeholders with different focuses, especially when they all believe their message is the most important. Figure out what is most important and put that first, and then you can subtly add secondary and tertiary messages. When we have multiple users with different goals, don’t try to fit them all into the same mold. Create separate paths for them to easily achieve their goals, and guide them to where they need to be. Don’t just let them fend for themselves and attempt to find their way, grab their hand and guide them. When it comes to UI elements, reduce, reuse and recycle! A website that uses different UI elements on every page gets confusing and frustrating. Reuse UI elements throughout your site so that your users become familiar with how the elements work. While the industry is great for exploring new ideas and creating UIs and designs that push the limits, you don’t want to design something so drastically different that your users won’t know how to use it. There’s a reason why certain UI elements work and it’s okay to use the successes of other UIs to impact yours. It’s a borrowing industry and we’re all improving the web together. These five UX fundamentals are key to creating easy-to-use interfaces that help your users achieve their goals. In today’s world we, as consumers, are faced with a million decisions every day. As a business in this extremely competitive world, we need to make sure our product or service is better than our competitors’. Part of rising above competitors is by giving our users the best experience with our brand or service as possible. User Experience is not only about retaining your existing customers once you get them, but could also help you to get new customers too. If your users enjoyed their experience with your product or service, they are likely to come back. If they really enjoyed it, they may even tell their friends. Giving your customers what they need in the best way possible can increase your ROI, so I think we can all agree that you need it. The real question is: how do you create it? The first step to creating a great user experience is to understand your users. It’s just like being in a relationship; if you don’t know what your partner values and needs, how can you make them happy? You’re essentially in a relationship with your customers, and you both have to understand each other and give something to the relationship for it to work out. So step one is to understand your user’s needs, values and goals. What was most important to you when you were looking for a company for this service? Why did you pick us over the competitors? What other competitors did you look at? How has your experience been? What things would you like to see improve? Research and data are great ways to understand who your users are and what they are doing on your site—interviews can help you to understand why. 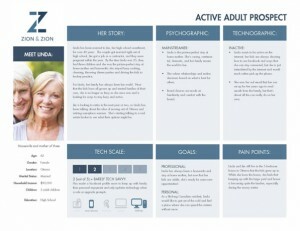 Personas are a great tool to ensure you create a positive user experience. Using the information you gathered from your user research, create personas. Personas are fictional users of your site that you create to help put a face and a story to your audience. You can use these personas throughout the website development process to ensure you’re building it with their needs, values and goals in mind. At each phase of the web development process, from design and content, through development, consider your personas for each decision you make. This allows you to think of your users as people, and ask real questions like, “would Sarah be able to easily navigate here?” or “would she understand the verbiage we used?” Understanding who your users are allows you to build a website that helps them to achieve their goals in the most user-friendly way possible. The key to creating a great user experience is to understand your users and learn to balance the needs of your business with your users’ needs. Once you’ve done user research, crafted personas, and truly understand your users, the real work can begin. Use this knowledge throughout every step of the web design and development process to continually ensure you’re building for your users. We use wireframes as the start of our web development process, as they give us a simple, low-fidelity way to start to architect what the user experience will look like. Consider the 5 fundamentals of user experience as you do this, ensuring a consistent, concise, and easy to understand UI that guides users down a path to achieve their goals. After wireframes we work on the content and the design, always bringing it back to the user to ensure we’re giving them the best experience possible. Doing user research, interviews and creating personas to craft your web strategy is a great way to make educated assumptions of what will give your users a great user experience. However, no matter how much research we do, no matter how experienced we are in the field, or how long we have been in your business, we can never know 100% what someone else will think. The best and only way to ensure a great user experience is to do user testing with actual users. Once you have done your best to create a great user experience for your customers, conduct tests to guide future web evolution for continual improvement. If you have access to your actual users, ask them to perform certain tasks on your website and give you feedback. If you don’t have access, there are many organizations that offer user testing, like UserTesting.com which allows you to set your demographics, give tasks and ask specific questions about your website. Getting first-hand input from your users is the best way to truly understand how users navigate and interact with your site to ensure you’re giving them an excellent user experience. This feedback will either verify that you do truly understand your users, or it will show areas of improvement and give you a guide for future web evolution.